The Secure Treatment Program at Souza-Baranowski Correctional Center in Shirley includes individual “therapy modules” for group therapy sessions. The plights of the three men are among eight cases documented by a prisoners’ advocacy group in a troubling new report to Governor Charlie Baker. The group charges that the state is unlawfully placing men with serious mental illness in solitary confinement despite a five-year-old legal agreement to end the practice. Attorneys for Prisoners’ Legal Services, who reviewed cases of mentally ill inmates at two state prisons, found eight with histories of suicide attempts and illnesses as serious as schizophrenia and bipolar disorder who have been sentenced to isolation for months, if not years, for disciplinary infractions. The organization has asked for a meeting with Baker and leaders of the Department of Correction to discuss their findings, which they believe indicate a widespread problem in the state’s 15 prisons. They say solitary confinement is both inhumane and ineffective, especially for people with mental illness. “We need to end these long sentences [in isolation],” said Bonita Tenneriello, a staff attorney with the Boston-based nonprofit group that promotes humane treatment of prisoners. “There is a much broader population of people in segregation who have mental illness who are being harmed and will never be rehabilitated” in that setting. The department’s director of behavioral health will work with the private company that provides health care in Massachusetts prisons “to ensure that these inmates are receiving appropriate mental health care and treatment,” said spokesman Chris Fallon. The report submitted to state officials included the inmates’ names, while the version shared with the Globe did not. 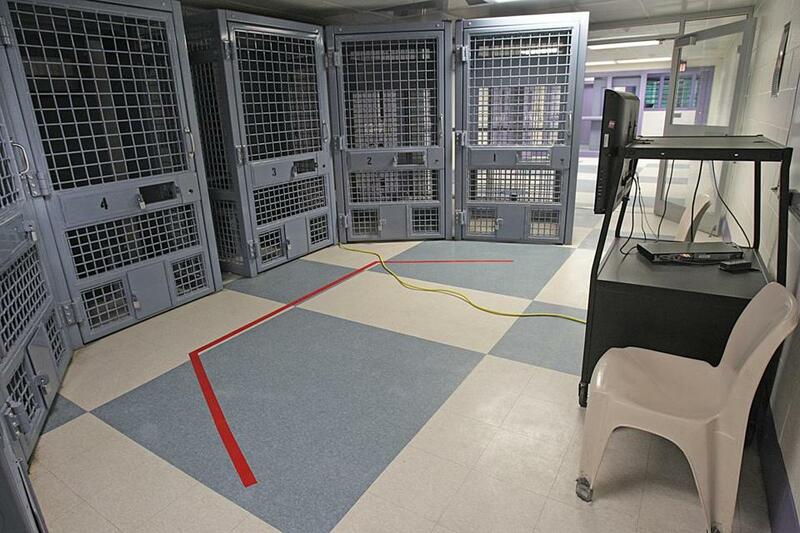 Massachusetts Partnership for Correctional Healthcare, known as MPCH, the for-profit company contracted by prison officials to provide health care to inmates, did not respond to calls and e-mails seeking comment. A spokesman for Governor Baker said the administration would not comment on the advocacy group’s findings, citing ongoing litigation stemming from a 2012 lawsuit concerning the use of administrative segregation, a similarly controversial practice used to separate problematic inmates from the general prison population for indefinite periods. The findings by Prisoners’ Legal Services follow a Spotlight series on the state’s failed mental health-care system, including the often inadequate care provided in prisons, where at least 30 percent of inmates suffer from mental illness. The Spotlight Team reported on one case in which an inmate diagnosed with a serious mental illness was sent to segregation with tragic consequences: Joseph Vyce, a 35-year-old with bipolar disorder, hanged himself in 2014 after months in the isolation ward known as the Department Disciplinary Unit, where inmates are locked in 23 hours a day. Prison officials declined to talk about his case; Vyce’s estate has informed the state that it intends to file a lawsuit. Joseph Vyce, a 35-year-old with bipolar disorder, hanged himself in 2014 after months in the isolation ward. Prison officials agreed to stop disciplining inmates with serious mental illnesses by sending them for long stays in isolation after Prisoners’ Legal Services and the Disability Law Center, another nonprofit advocacy group, sued the department in 2007. Under the agreement that ended the lawsuit, state officials promised to send male inmates with serious mental illness to two specialized mental health treatment units within the prisons instead. The Department of Correction maintains a total of 29 beds in those units, which Prisoners’ Legal Services says is not enough to accommodate all the inmates who need them. Prison officials said in 2016 that the capacity of the treatment units is adequate, with only a handful of inmates on waiting lists. But Leslie Walker, executive director of Prisoners' Legal Services, said she believes prison officials are reluctant to add more beds and admit more patients to specialized units because the cost of care is higher there. “We’ve seen it often enough, and for years now, that there is pressure from DOC to keep costs down,” she said. Attorneys at Prisoners’ Legal Services analyzed the medical records of each of the eight men, looking at the diagnoses they had been given over the years from the Department of Correction, outside doctors, and in county jails. In nearly all the cases, the men had been diagnosed with serious illnesses by doctors who examined them when they were still on the streets or in county jails. But once they were in the custody of the Department of Correction, the lawyers found, diagnoses in all but two of the cases were changed to less serious conditions like anxiety, or to personality disorders. The downgrading of the inmates’ diagnoses made them eligible to be placed in segregation under the 2012 court settlement. Prison officials said earlier this year they had never heard of prison clinicians adjusting diagnoses to save money. In two other cases cited by the advocates, prisoners did not have their diagnoses downgraded, but were sent to isolation anyway. One of the eight inmates, Alfred Disessa, 44, agreed to be quoted by name in describing his most recent 15 months in segregation. His time alone in a dark and dirty cell made him care less about himself, he said, and eroded his ability to be with people. One former inmate who spent long stretches in segregation, Clarence Blevins, said its effects have stayed with him since his release from prison. Correction officers, who confront the threat of violence daily, tend to be the most supportive of the use of segregation, say prison experts. Officials from the Massachusetts Correction Officers Federated Union did not respond last week to requests for comment. But Walker said men are often sent to isolation for minor infractions — one man, for instance, was sent to the disciplinary unit for six months for throwing a carton of sour milk at an officer. Walker said she represented an inmate who was thrown into solitary after he tried to organize a work stoppage in the prison kitchen. Across the country, there is a strong movement to limit the use of segregation in prisons, especially for juveniles and people with mental illness, said Natasha A. Frost, an associate professor of criminology and criminal justice at Northeastern University who coauthored a recent paper on segregation for the National Institute of Justice. Change is driven by growing concern about its possible harmful effects, as well as its high cost and few benefits, she said. Prisoners’ Legal Services estimates the state is spending between $100,000 and $170,000 per year to house each inmate in segregation, compared with the $50,000 cost of keeping an inmate in a regular cellblock. The organization said the extra funds used for segregation would be better spent on treatment, rehabilitation, education, and employment programs that would reduce the chances of recidivism once an inmate is released. The use of segregation should concern the public, the advocates said: Inmates sentenced to long stretches in segregation could wrap up their sentences there and be released straight to the streets — a practice found to increase reoffense rates in studies. In Washington and California, inmates released from solitary confinement committed new crimes at a rate 35 percent higher than parolees released from the overall prison system, according to a 2015 report by the American Civil Liberties Union of Texas. “They put these people in solitary because they think they are too dangerous for general population — yet they are willing to let them walk out the door straight out of solitary confinement,” Walker said. In their letter to Baker, lawyers from Prisoners’ Legal Services asked that Massachusetts end the practice of putting inmates in solitary for punishment, even if they are not mentally ill.
“We hope that this report will be the first step in a discussion of reforms that can save taxpayer dollars without compromising prison safety — while curbing a practice widely viewed as cruel and harmful,” Walker wrote to Baker. Maria Cramer can be reached at maria.cramer@globe.com. Follow her on Twitter @globemcramer. Jenna Russell can be reached at jenna.russell@globe.com. Follow her on Twitter @jrussglobe.